This policy brief illustrates how the Russian top leadership discusses climate change and responds to interventions and efforts made by other countries’ leaders and high-level diplomats on the topic of climate change. 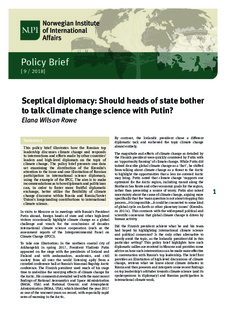 The policy brief presents one data set examining the distribution of the Kremlin’s attention to the issue and one illustration of Russian participation in international science diplomacy, using the example of the IPCC. The aim is to make recommendations as to how diplomats and politicians can, in order to foster more fruitful diplomatic exchange, better utilize the flexibility of climate change discourse within Russia and Russia/Soviet Union’s longstanding contributions to international climate science.